What's that smell? Get over your fear of stinky cheese at this sampling of international washed-rind cheeses paired with wine. The class will take place on Monday, March 5, from 6:30 p.m. to 8:30 p.m., at the Artisanal Premium Cheese Center, 500 West 37th Street, 2nd Floor. $75/person (877.797.1200). 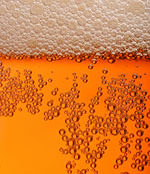 The third event in the New York Academy of Science's five-part "Science of Food" series will feature an in depth discussion of the science of brewing, led by Charlie Bamforth, PhD, DSc, chair of the Department of Food Science & Technology and Anheuser-Busch Endowed Professor of Malting & Brewing Sciences at the University of California, Davis. The lecture, followed by a beer tasting, will take place on Monday, February 26, 6:00 p.m. to 7:00 p.m., at the New York Academy of Sciences, 7 World Trade Center, 250 Greenwich Street (212.298.3725). Ben & Jerry's has announced that it is honoring mock pundit Stephen Colbert with a new flavor called Stephen Colbert's Americone Dream, which combines vanilla ice cream with fudge-covered waffle cone pieces and caramel ("the sweet taste of liberty in your mouth"). "I'm not afraid to say it. Dessert has a well-known liberal agenda," Colbert said in a statement. "What I hope to do with this ice cream is bring some balance back to the freezer case." 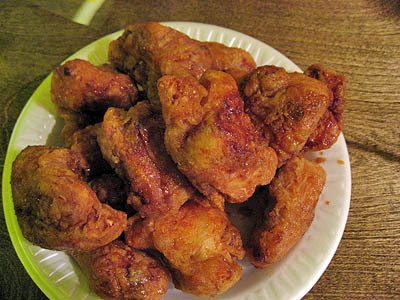 A recent article in the New York Times by Julia Moskin on a wave of new Korean fried chicken spots in New York City inspired a serious craving to taste the chicken for ourselves. We headed to Unidentified Flying Chickens, the upstart chicken place on Roosevelt Avenue in Jackson Heights. It's only been open for about a month, and while they are still working out the kinks, we found that the chicken was top-notch (a self-described "volunteer" and friend of the owner confided that the chicken has come a long way since the place opened). Moskin describes the cooking process in detail in her article: the chicken is coated lightly with flour and batter before a two-step frying process under low temperature that "renders out the fat in the skin, transforming it into a thin, crackly and almost transparent crust." Everything is cooked to order, so be prepared to wait at least 15 minutes for your chicken to be fried (or, better yet, place your order by phone in advance). There are chicken salads and sides on the menu, along with two breaded chicken cutlet paninis, but the fried chicken is the main event. Orders come in sizes of large ($15.99) or small ($8.99) with a choice of sauces. We went with soy-garlic, a slightly sweet and salty glaze lightly and deftly painted on each of the pieces. The chicken is incredibly succulent and moist -- almost puffy -- with a thin, crisp exterior. The birds desperately deserve to be paired with beer. But, none is currently served, so plan on bringing your own. 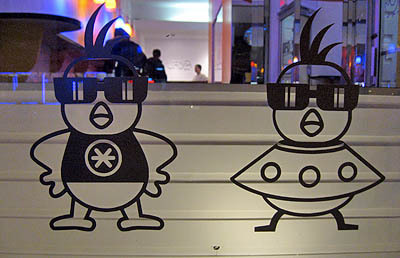 Unidentified Flying Chickens, 71-22 Roosevelt Avenue, Jackson Heights, Queens (718.205.6662). One thing I learned from my dishwashing days at Bette's Diner (aside from proper latke-making technique), is the usefulness of clarified butter. It has a very high smoking point, so you can bring your pan to high temperatures to make the perfect omelette without risk of burning your butter. It's not hard to find the stuff in an Indian grocery (sold as ghee), but I recently spotted Plugrá Clarified Butter, a clarified version of the European-style butter. $5.99 for a 12 ounce jar at Gourmet Garage (or find a store near you). The Artisanal Premium Cheese Center will present a discussion and tasting event pairing Scotch whiskey and cheese. The course, led by by Artisanal's Jon Lundbom and Ethan Kelley, Spirit Sommelier for Tribeca's Brandy Library, will take place on Monday, February 19, 6:30 p.m. to 8:30 p.m., at the Artisanal Premium Cheese Center, 500 West 37th Street, 2nd Floor. $75/person (877.797.1200). 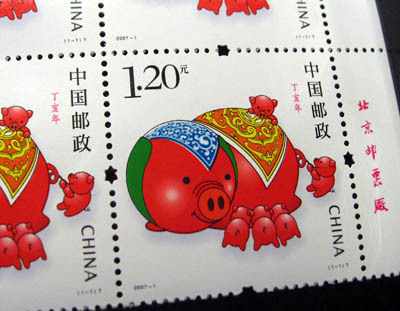 I recently posted about some new Chinese stamps printed to celebrate the Year of the Pig that reportedly tasted and smelled like sweet and sour pork. But, when TFS reader Jennifer wrote in questioning the veracity of the story, pointing to this article skeptical of the claims, I headed to eBay to purchase a set of the scratch 'n sniff stamps and see (and smell and taste) for myself. Unless my stamp-tasting palate is in serious decline, I regret to report that, when scratched, the stamps bear no smell and the back tastes simply of glue (without even the faintest hint of pork). Are you so tired of hot chocolate that the bone-chilling cold inspires a counterintuitive and unseasonal winter craving for frozen custard? 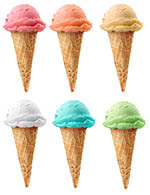 MAKOR will present a discussion of ice cream and its "sensory, aesthetic and technical characteristics" along with a blind tasting hosted by Bobbie Meyzen, co-owner of La Cremaillere Restaurant and Crème Cremaillere Ice Cream in Bedford, New York. The event will take place on Thursday, February 8, 6:30 p.m. to 8:00 p.m. at MAKOR, 35 West 67th Street. $35/person (212.601.1000). »A Voce $72/person for three courses (41 Madison Avenue, 212.545.8555). »Bar Americain $90/person for three courses, or $125/person with suggested wine pairings. (152 West 52nd Street, NYC, 212.265.9700). »Café Gray $210/person for five-courses, including a glass of Champagne (Time Warner Center, 10 Columbus Circle, 212.823.6338). »Cookshop $70/person for three courses (156 Tenth Avenue, NYC, 212.924.4440). »davidburke & donatella $105/person for five courses (133 East 61st Street, NYC, 212.813.2121). »Flatbush Farm $65/person for three courses (76-78 St. Marks Avenue, Brooklyn, 718.622.3276). »Goblin Market $70/person for three courses (199 Prince Street, 212.375.8275). »Ureña $90/person for five courses (37 East 28th Street, 212.213.2328).